School’s out for summer so bring your friends, meet like-minded art lovers and get into the end-of-year spirit at the Youth Collective’s final FOMArt event for 2018! We’re kicking off the day with live music by dream-pop duo Egoism. Take part in a Gallery-wide ScavengART hunt and go into the running to win some great prizes! Then hang out with your friends over snacks and art-making during DIY for under 25s. Egoism is a dream-pop duo hailing from Sydney’s inner west featuring Scout Eastment and Olive Rush. The two met in high school where they formed a band and played at house parties, warehouses, shop fronts and anywhere they could sneak-in their friends. In 2016, their reputation grew in the local music scene when they started supporting bands including Last Dinosaurs, Flyying Colours and Phantastic Ferniture. 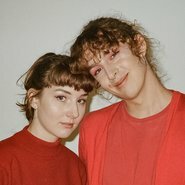 This year Scout and Olive started writing and recording tracks for their forthcoming 2nd EP and their new single ‘Sorry’ was released in September, a driving dream-pop anthem full of twinkling guitars and bittersweet harmonies coming together with a strong anti-gaslighting message. Wrap your brain around art trivia questions and cryptic clues during the Youth Collective’s Gallery-wide scavenger hunt! Discover works in the Gallery’s collection and explore the dynamic artworks on display in our current exhibitions. All registered participants aged between 15 and 25 will score one free entry into Masters of modern art from the Hermitage and the highest scoring team will win a fantastic prize pack! You have to be in it to win it – register now for teams of up to 4! We’re bringing back our favourite art-making activities from this year’s series of DIY for under 25s . Express yourself with customised badges at our badge-making station then design your own calico bag with pens, fabrics and stencils. Enjoy all of this and more over snacks, drinks and a curated soundtrack by the Youth Collective.